Populus balsamifera is a tree to 28 m tall, 90 cm dbh, young bark dull gray, old bark furrowed, buds smooth, brown, sharply pointed, often colonial from root sprouts, buds contain aromatic chemicals that are released at bud break. 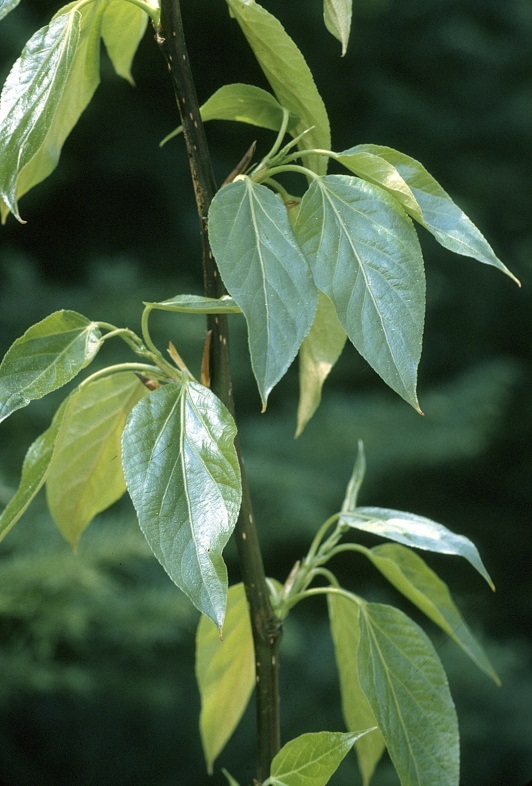 Leaves alternate, egg-shaped, tip pointed, base blunt to rounded or slightly lobed, margin usually finely serrate, dark green above, whitish below, to 15 cm long, 10 cm wide, leaf stalk cylindrical; leaves expand early May, winter plant leafless 170 days (Britton 1874). Flowers in catkins; blooms March-April. Fruit a dry capsule with tufted seeds, wind-dispersed. Origin: Native to Western North America (USDA, NRCS 2010), or North eastern north America (Petrides 1988); planted in remediation sites and sometimes along highways. The most frequently planted tree is a female clone of a tree with hairy petioles. Habitat: Usually grows in flood plains, soil pH 5.5-8. Notes: Susceptible to the poplar and willow borer (Cryptorhynchus lapathi) and other insects that attack poplars. Attacked by Phellinus tremulae and other pathogenic fungi (Burns and Honkala 1990; Preston 1976). A host tree of the Asian longhorn beetle, Anoplophora glabripennis (see Norway maple).